Begin with early morning pickup from your hotel in the Alanya region. Pickups are available in and around the area and Antalya, including from the Goldcity, Utopia World, and Karaburun hotels; and hotels in the Cleopatra area, Kargica, Konakli, Oba, Turkler, Mahmutlar, Okurcalar, Avsallar, Incekum, Keste, and Tosmur. Travel by air-conditioned vehicle to Ataturk International Airport, and catch your flight to Istanbul. Then, on arrival, meet your local guide, and drive into the city's old, UNESCO-listed Sultanahmet quarter. Visit the Topkapi Palace, the main residence of the Ottoman sultans between the 1600s and 1800s. Stroll around the halls and pavilions of the imperial court, and admire the regalia at the Treasury, plus displays of Islamic treasures, weaponry, and imperial robes. If you wish, visit the palace's former Harem (additional cost). After a lunch break (own expense), explore the Hippodrome, where historical monuments mark out the city’s Byzantine-era sporting arena. Learn about the chariot-racing and other events once held here, and view antiquities including the Serpentine Column, Theodosius Obelisk, and Fountain of Wilhelm II. Continue to the Blue Mosque, one of Istanbul’s best-known landmarks. Admire its domes and six minarets, and explore inside with your guide. Hear about this 17th-century masterpiece and marvel at the exquisite blue tiles that lend it its name. Next, delve into the colorful Egyptian Bazaar, also called the Spice Souk. 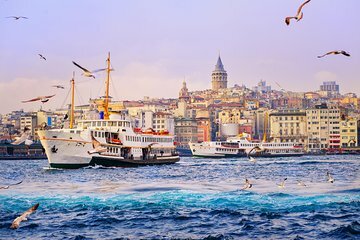 Haggle for goodies at the spice, sweet, and food stalls, and then, enjoy an optional cruise (additional cost) on the Bosphorus — the strait dividing Istanbul’s European and Asian sides. Admire the views as you cruise between Europe and Asia before finishing with a tasty 3-course dinner (own expense) of dishes such as fish, meatballs, or chicken at a local restaurant. Finally, transfer to the airport and fly back to Antalya, concluding your trip at the starting point.